Out of the box, any e-caller worth it's salt has to have something for everyone, whether you're calling animals to see them, photograph them, or hunt them. It will probably arrive with 75-100 sounds, fewer once you weed out those that don't really fit your location, its laws, and your game. ** Tuned up, in the hands of individuals in various corners and cracks of the USA, e-callers have probably called the full American zoo of curious critters. Like the new e-caller, this article probably has something for every game caller but, it has a slant. It's perspective is aimed at a more narrow audience, the western predator caller. In the pages that follow, you'll find a long list of sounds from all kinds of sources with descriptions, some facts about loop length, sound quality, and occasionally a short opinion on the sound's utility in the comments section. If you skip ahead to the soundlists, look for sounds with 3 or 4 stars ****. Those are the best in every list. To start with, here are the notes on the files and rips. I listened to every sound a couple of times, first as it was put to the ADC, and again while being viewed in an editor. Some were short, a few seconds. Most of the better sounds from the digital ecallers were about a minute. Going back before the invention of memory cards, I also ripped a large collection of cassette tapes. Sometimes this obsolete technology was the only source of some outstanding classics recorded 30-60 years ago. Then if it's possible, I compared the new with the old. Ideally, I was listening to a quality live animal recording or nuanced handcall sequence on well modulated media and without noticeable audio artifacts. It was loud and clear, with no hiss, clicks, hums, wind, traffic, or any other background noise. Too often, that was not the case. More objectively, beyond recording quality, the best sounds also have a hunting beat. Whether it is a loud and needy scream, or a soft and squeaky chirp or whine, it must possess the urgency, intonation, and cadence to call a western coyote. The timeline of any file is the sum of it's sounds and pauses. The timeline has structure. When these sounds were viewed in the editor, the silence, both the pauses as the animal inhaled and the pauses between sets of screams formed an important part of that structure. In the case of e-files, I looked at the file's format, the bits and bytes that let it sound good, but keep it small enough to send, store, and use. It is not possible to eliminate my own bias in these ratings completely. However, when it came to ratings I have tried my best to edit out anything personal relating to the odd characters that dominate the business and stick to the hunting facts. As I approach the thousand mark, I have a pretty good idea of what has worked and what didn't. Still, hunting beat is a tough parameter to judge. The fact is that the coyotes don't always care what I think either. They occasionally come to anything now and then regardless of source. Danny B swears he called one with a Willy Nelson tune. I called a coyote in for a look with a squeaky office chair while reading a book on the patio. I have also used several dog and childrens' toys that made noise and been successful. I even used a recording of a squeaky hinge on the back door a few times. Humans on the other hand do care. They prefer sounds that aren't too short, repetitive, boring, distorted, or grating on their ears. In that vein, I tried to list an approximate loop length for every file. I can't tell you whether a screeching bird, repeating rabbit, squeaky rodent, or yelping puppy will work best in your area, but I can just about guarantee that one or the other will call in something wherever you live. A sound list that contains several of each of those types is better than one that doesn't. I can say with some degree of certainty that I would rather have a mediocre caller with a great list of sounds than a fantastic caller and a few marginal files to use on it. A lot of the electronic gear currently available is loud enough and clear enough to call a coyote. You can figure out which sounds work best for yourself in your own area. Here's the timeline of a short and well planned file from Les Johnson that he can email quickly and that works on any e-caller with pause and play buttons. The entire sound is under 2 minutes. These are 30-40 seconds of distress cries and 5 second spaces in which to react and pause the caller. It's long enough to use in doses and not get boring. It was a monaural file and an MP3, both meant to keep the file size as small as possible for easy emailing. Finally, Les's handcalling was top notch. Here's another sound, a Byron South continuous live distress recording, edited by me with even shorter call sequences and shorter quiet spaces, just enough to find the pause button. Imagine that each of the pauses is extended to two minutes and it's easy to see that the whole file will be played less than twice through a 12-minute stand. Edited correctly, an electronic file can be both top quality and small in size. It won't have multiple repititions of the same few sounds or the long sections of silence sometimes found on choreographed cassettes, but it will have both a handful of quality sound sections and some easy to recognize places to pause. Hunting with only one hand on the e-call remote and using a minimum of button pushes, you can play the sequence and know when to pause it. Hit play to resume. Hit send to start over. Or, just let it play. Handcalls are extremely useful on a hunt. Learn to make your own handcall sounds. With some practice on a modern mylar or metal reed, it's quite possible for almost anyone to mimic the tones and cadence of a disressed animal well enough to call coyotes. The best sounds can be old or new. Newer recordings tend to be shorter in length. The best live animal recordings, long recordings with 3 to 5 minutes of unrepeated sound, still come from Johnny Stewart or Murray Burnham, and they are fifty years old. Foxpro, the new guy, already has a bigger and badder catalog than either Johnny or Murray, and continues to actively seek and record more sounds for their .fxp and .24b libraries. Their sounds are a real mix and they vary substantially from one to the next in both content and length. Foxpro's Mark II files are usually less than 80 seconds in length. 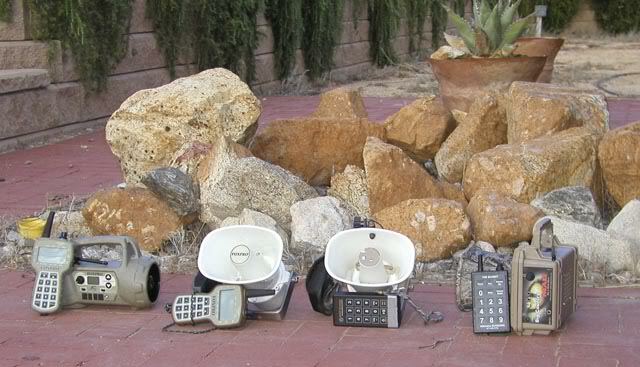 They are some of the best high resolution live animal recordings ever offered for sale with an e-caller. Check out the tables and judge for yourself. FPSR - Foxpro Shotgun Remix; it actually had a few pauses in the sound. You won't find many. Foxpro's sounds typically play continuously. Brickwalled - The gain was too high somewhere, either the master or the retail tape. To the ear, it sounds like a ripping noise. It's called distortion for that reason. In an editor, the flat topped waves look like junk. It happens. WIM - stands for "Woe is Me!" another rabbit sound with a lot of tremelo or vibrato. ** Two star sounds were decent, but flawed, usually downgraded for being short and monotonous. *** Three star sounds are good enough for hunting, but still lacked something, urgency, length, or recording quality. **** Four star sounds were the best in each soundlist. Wherever possible, I tried to find at least a few in every section. CDs were transferred to native 44.1KHz/16-bit. Tapes were digitized with a Teac AD-800 player, Behringer (48KHz/24-bit) external sound card, and recorded with Audacity 48KHz/32-bit on a Mac. Files were normalized to -1 db where possible, d.c. offsets corrected, and some were filtered to remove various noises. Everything was trimmed to try to get a handle on the real length of the loop. Sounds that had obviously been dubbed together to be longer were noted in the comments. Everything I digitized from analog was archived as 16-bit WAV. Instructional tapes went to .flac. This is the timeline of a cassette tape, Haydel's Coyote Fight. It's a full thirty minutes and was recorded so a hunter could turn it on, put the player in the weeds, and walk away. I'm glad that not all the sounds were 15 or 30 minutes long. Digitizing old cassette tapes, deconstructing CDs, and comparing the results to short proprietary files with camouflaged loop lengths is challenging There is a huge difference between a 30 minute plastic cassette tape, a 15-minute track on a Compact Disc, an MP3 file attached to an email, and a 0.4 second sound file graphed on a digital editor. They are not equal. Pay attention to the time scale at the top of each of the graphs that follow. They range from minutes to milliseconds. The next whole graph is only 4 seconds and the sound, Wildlife Tech's Cougar Baby, is less than half a second, and then it repeats. This sound probably qualifies as the shortest single sound ever sold to the public for predator calling, for $30 no less. I'm glad that not all the sounds were half a second. Listening to them repeat endlessly in the field on a daylong hunt is severely annoying. Pay attention to the time scale at the top of the next graph again. The next one is only 6 milliseconds. Some sounds were recorded by the seller with the gain too high. The wave bumps against the top and bottom of the medium. The tips are flattened or "clipped." It changes the sound and adds a "ripping" noise that is called distortion. It's physically impossible for a speaker to accurately reproduce clipped sounds. Setting the gain too high anywhere in the signal train is as bad as setting it too low. Turning them up or amplifying them in an editor results in lots of hiss or white noise and is entirely unsatisfactory as well. The sound above isn't loud enough nor is it silent between the sound. Moving on, the sound shown below is the same as the one above except a filter was used to reduce noise. The silent portions between the animal screams should ideally be silent. Filtering the noise is something that should be done before the sound is sold to the public. This was a cassette tape. Cassettes seem to lose some of their gusto in time. Whether this was recorded improperly or is just an old tape is anyone's guess. The Foxpro analog grab shown below shows two elements of quality: (1) modulation matched to the medium; (2) real silence in the silent sections. The sound above is a good one. The cries are loud and clear. The silence between the cries is actually silent. This kind of sound is going to make the best use of any electronic caller. Advances in digital sound allow the average guy with computer to make faithful copies of a sound without any expensive sound gear. Third, fourth, and fifth generation copies of copies are as good as the original. 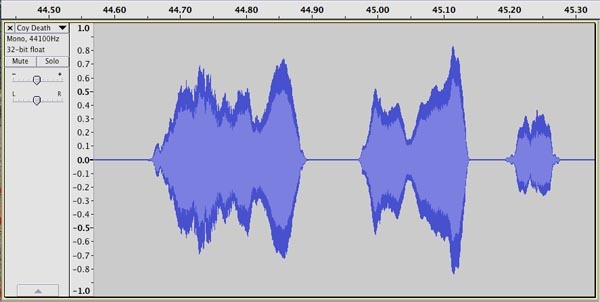 This 2-channel sound from a Crit'R Call CD, has the same exact track recorded on both Left and Right without any changes introduced by ADC/DAC . Two-channel sound isn't stereo; it's just the same exact sound recorded in two seperate channels. 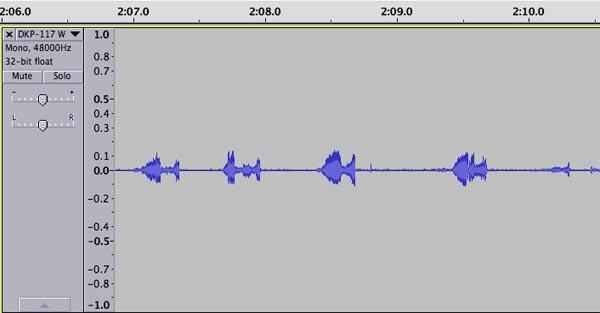 Here's a true stereo jackrabbit shown below, the same sound through 2 microphones into 2 channels. Stereo tracks of a single source sound (not a band recording of multiple instruments) typically appear like the two channels shown above. The phase and amplitiude are shifted, but it has a beat and you can dance to it. That's enough of looking at waves. Go read some of the other pages. There are some gems in this list in odd places. All ratings are subject to review and revision. New files are still being added. **Your state probably has its own set of hunting laws pertaining to the use of sounds to call wildlife.